COSCO Shipping Ports Ltd and PSA Corporation signed a memorandum of understanding yesterday to add two new berths at the COSCO-PSA Terminal (CPT) in Singapore. The launch of the two new mega-vessel berths will increase CPT’s annual handling capacity from 3 mln to about 5 mln TEU and will strengthen CSP’s presence in Singapore and in the Southeast Asia. Established in 2003, the joint venture terminal by COSCO Shipping Ports (49%) and PSA has served as a major hub for container shipping in the region and also supported the needs of COSCO Shipping Group. The new berths, like the current three berths, will be supported by the automated yard technology at PSA’s Pasir Panjang Terminals, allowing for more efficient berthing arrangements, and enabling the terminal to increase productivity and greatly enhance its service capability and quality. 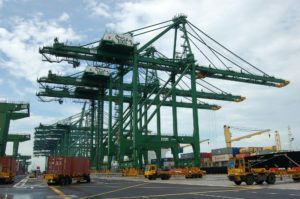 CPT is one the 4 joint venture terminals established by PSA in the port of Singapore with major shipping lines. Other JVs include MSC-PSA Asia Terminal, CGM-PSA Lion Terminal (established with CMA CGM) and PIL-PSA Singapore Terminal Pte Ltd (established with Pacific International Lines).